I, personally, have not ever had cancer. I did, however, have a tumor removed from my abdomen that is associated with colon cancer. I have a long line of family members that have had cancer and have survived. So, whenever I can gather more information on a healthy lifestyle that can help me live to my fullest, I am happy to read it! I came across The Cancer Survivor’s Guide and knew that this was a book I wanted to read. I can’t say enough good things about this book! It is what it says it is…a guide to healthy living. This book is a lifestyle guide on how to live the healthiest way you can. The Cancer Survivor’s Guide gives you tons of information on the foods you eat or should eat and why they benefit you. It gives you details on what specific vitamins and minerals do for your body and how they help fight off cancer. I like that it references different studies and tells you when things are proven or merely a suggestion from the results of the studies. It also gives you daily diet checklists so you can evaluate, from your current diet, if you are getting the proper nutrients in the food you eat and if you aren’t, how to get them. There are suggestions on meal planning and helpful lists on how to find things at the grocery store. This book promotes a vegan diet, so it gives you alternatives to dairy and meat in your meal planning. The end of the book has a variety of recipes that help you use the information you just learned. With the recipes, it gives you a little more information on what benefits you get from the foods in the recipes. The information is written well and is easy to understand. I tried a couple of the recipes so far. I decided to make a meal out of options in the book. 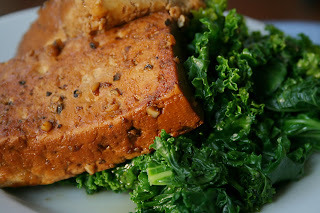 I made the baked tofu with braised kale. Both were delicious! I am definitely going to keep this book close by for more great healthy recipe options! Oh my goodness, Sarena, I'm so thankful that you're okay and that it wasn't cancer!! Stay strong. This book sounds really great. My granny fought cancer for many many years, but I saw her eating foods/drinking alcohol that I knew wouldn't really help her in the long run. I'm glad there's literature out there to help people eat to work with their body, not against it. And I love me some kale. If you ever come to LA, get the vegan benedict at M Cafe. 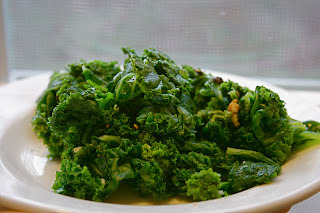 Kale insanity. This book sounds fabulous. So glad that you're okay and doing well! Thanks for clueing us in about this great book.